I think most of us have used them or at least know someone who has. 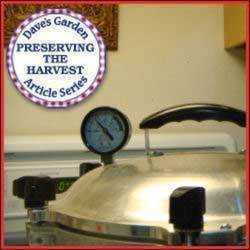 Have you ever thought about how this versatile device revolutionized home food preservation? I have been a home food preserver for all of my adult life. As a child, I remember watching my mother, grandmother, and aunt "putting up" tomatoes, corn, peaches, etc. It was just a way of life; everyone I knew did it. Back in the 1970s I attended the Master Canner Class conducted by Michigan State University Extension. This was a 12-week class, which consisted of 36 hours of instruction, as well as hands-on exercises covering all aspects of food preservation. After completing the class I was certified as a Master Canner. But with all that training, I admit I had never given a thought to the evolution of the canning jar, even as I continued to preserve foods. 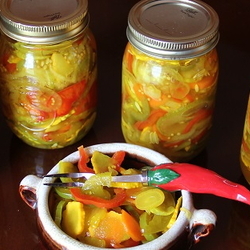 We can attribute the invention of today's canning jar somewhat to Napoleon Bonaparte. During the Napoleonic wars which raged across Europe for fifteen years, opposing armies had left the countryside stripped of all food sources. Napoleon was having problems procuring food for his troops. The French troops were suffering from scurvy and starvation; something had to be done. The French government offered a reward of 12,000 francs to anyone who could develop a method to preserve food. Nicolas Appert was a candy maker and chef from Paris, and he arrived at a solution after several years of experimenting. He discovered that foods packed into glass containers which were sealed with a metal disc and wax, and immersed into boiling water would be edible for extended periods of time. Appert was awarded the 12,000 franc prize in 1806. In 1858, John Mason, a tinsmith from New Jersey came up with a procedure in which he produced a jar with a threaded opening on top, and a reusable lid that could be screwed on, sealing the container. The closure consisted of a zinc coated threaded lid, and a reusable rubber ring, better known as a "jar rubber," which made the jar airtight. 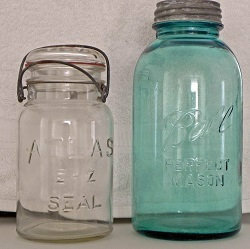 There are a couple of factors that made Mason's invention different from other glass jars. The glass was much thicker than single use containers, making it much more suitable for multiple uses. The square "shoulders" added strength which enabled them to tolerate many immersions in boiling water as well as the heating and cooling cycle. Masons jars worked well for over 20 years until Henry Putman came up with a glass jar, incorporating a glass lid, and a wire bail which helped to hold the lid tight against the jar rubber. Folks preferred this method because the food didn't come into contact with the metal on the lid as with Masons containers. These were known as "Lighting jars". Manufacturers of Mason jars countered the fear of food coming into contact with metal by adding a glass insert into their zinc lid. The Hermetic Fruit Jar Company was established by Alexander Kerr in the early 1900s. Kerr invented a disposable flat metal disc with a rubber sealing compound that worked in conjunction with a reusable screw band which worked much better than previous methods at a much lower cost. This is the very same method still in use today. Six brothers named Ball operated a business in Buffalo, New York that manufactured wooden lined tin containers for storage of lard, oils, and paints. In 1883 the Ball brothers changed their tin containers to glass, and three years later began to manufacture glass fruit jars. A fire destroyed their New York plant, and they moved their operation to Muncie, Indiana after the city offered them free land on which to rebuild their factory. The Ball brothers set up their new operation and began to acquire many of the smaller jar manufacturers, and as they say, the rest is history. The Ball Corporation became the largest manufacture of canning jars in the world. As a back story, the Ball Brothers became prominent citizens of Muncie. In 1917, the Indiana Normal Institute found itself on the verge of bankruptcy. The Ball Brothers realizing that this institution was one of the important suppliers of teachers in the state, paid off the debt and gave the college to the state which renamed it Ball State University which is a thriving institution of higher learning today. The photo show two of my older jars, on the left a "Lighting" jar and a Ball jar with zinc lid from 1923-1933. I cannot think of another device which has been in use for well over 100 years, which still works as well as the day it was invented without having been improved upon. Next time you're making jam, or canning tomatoes, take a moment to thank the Ball Brothers, John Mason, and all the others who perfected the canning jar. 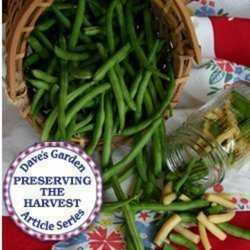 Preserving the Bounty, a Summary of Food Preservation (Part 1) Preserving Green, Wax, or Snap Beans: Canning versus Freezing Pressure Canning Phobia - Don't be afraid!